These fluffy pathiris are a speciality of Malabar cooking, with only the thickness varying across the Northern Kerala. Though I am from Calicut, I would say the Malappuram people make the thinnest softest, melt-in-your-mouth pathiris. They would probably scoff at my pathiris considering the thickness to be too much. I love these with Drumstick leaf curry. You do have to eat a lot of these before satiation and that is precisely why these are never the main course. 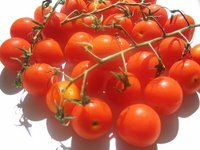 They are traditionaly used as tantalising appetisers or as a delicacy, nestled among the lavish spread of a banquet table. I love being in Calicut when it is made at home. When there is a feast involved, my aunts and my mom get together and make it in a flurry of conversation and laughter. One person would be rolling and another one would be handling the griddle all at the same time, culminating in huge piles of pathiri. Its the time to catch up on gossip and tidbits as they slowly fill the pathiris with their sounds. Making it here, with only music to keep me company somehow is just not right. But I still do, without a pathiri press,(only because I don't have one) just to recreate the moment. The rice flour I use is Double Horse Pathiri Podi or any other rice flour from Kerala. I have also tried with the regular rice flour from the Indian stores, but they turn out to be hard. I am not sure what rice is powdered to make the flour and whether that is the difference in the powders. 1. Boil the water with salt. When it is churning and roiling nicely, pour in the flour, make a hole in the center with the handle of a long handled spoon, cover with a lid, lower the heat and let it cook for a minute. Uncover and stir well with the handle or stick till it is well mixed. Remove from fire and keep covered for another 10 minutes. Open and when it is cool enough to touch, empty the flour mix on to a wide plate or kneading surface. 2. Knead well for about 5 minutes without adding any more water till the dough comes together with a uniform super smooth surface and is no longer sticky. If it is pebbly, it needs more kneading or it was not mixed well with the water initially. You could wet hands and knead again if it needs only a tiny bit of water. If it is sticky, the proportions were not followed correctly. Any water or any flour added at this point will change the texture of the pathiri so the first step has to be done with care. 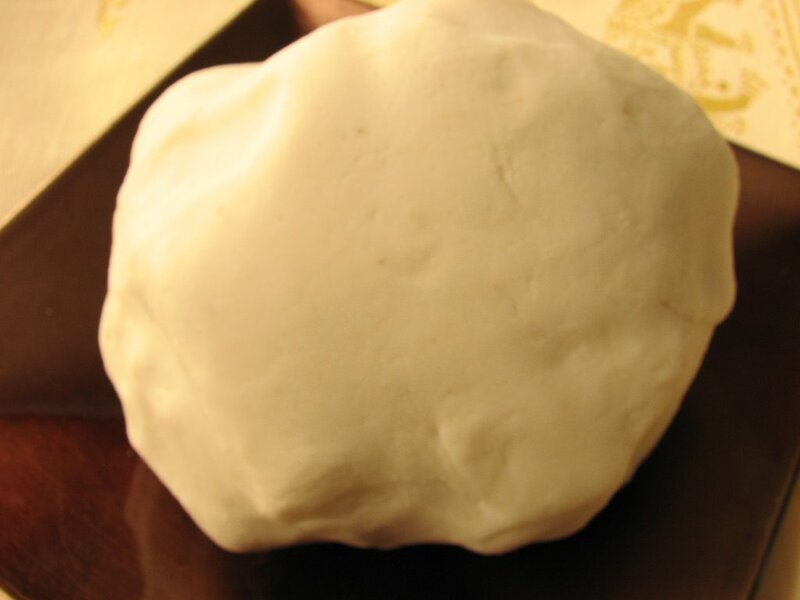 3.Make a log of the dough and cut of equal sized balls of about the size of a small lemon. 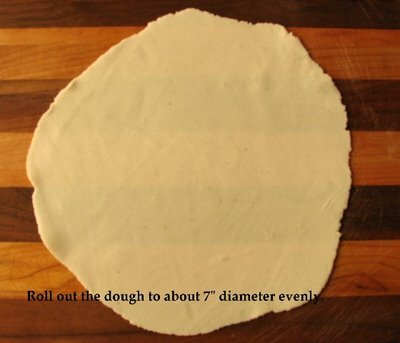 Roll it out evenly into very thin pathiris or tortillas. Sprinkle rice flour while rolling to prevent sticking taking care not to use too much. (Too much makes the pathiri hard.) 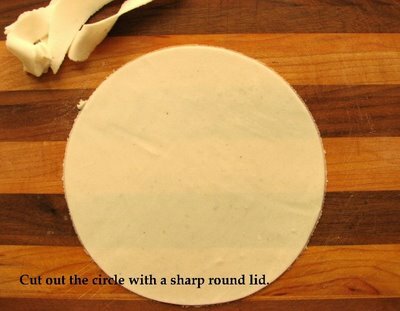 Cut with a round cutter or a lid with sharp edges to make perfect rounds. 4. Heat up a tava/griddle, preferable a cast iron one, and when it is medium hot, place a pathiri on it. After a few seconds, turn it over. Repeat this once more. 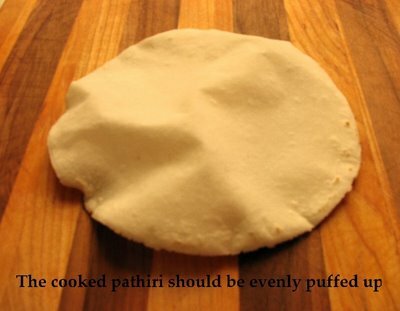 When you see the pathiri turning opaque, use the back of a spoon to spread the heat, without pressing down too hard. When it puffs up, remove it from the griddle. 5. Smear a tablespoon of coconut milk on each pathiri and keep covered. Alternately, each pathiri is dipped in coconut milk just before serving. P.S. : The heat should be consistently medium hot to allow the layers to separate. 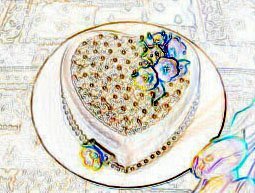 If the heat is too low, it will either turn hard and if it is too high, it will brown without cooking the inner layers. Once the layers puff up, take it off the flame immediately. 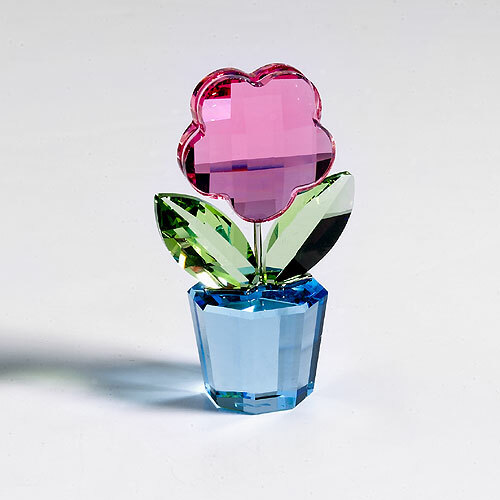 Looks so lovely and delicate ! Never seen a rice roti puff so much ! Look at those fluffy pathiris !!! This is one roti i am overly fond off, just can't stop eating.. Thank you for the step by step instructions Shaheen. Lovely photos. i have been waiting for this! Those look so delicate. I just cant wait to try those. A must try recipe,Shaheen..many many thanks..
Krithika: Thanks.They are soft because they puff up so much. Archana: Hope you would try it. It is yummy with a chicken curry. RP:Now I know why I don't make these often.Wish I had a pathiri press.It is not fun doing everything at one go with no help. Fellow Keralite..You are welcome. Hope u will try it and let me know. 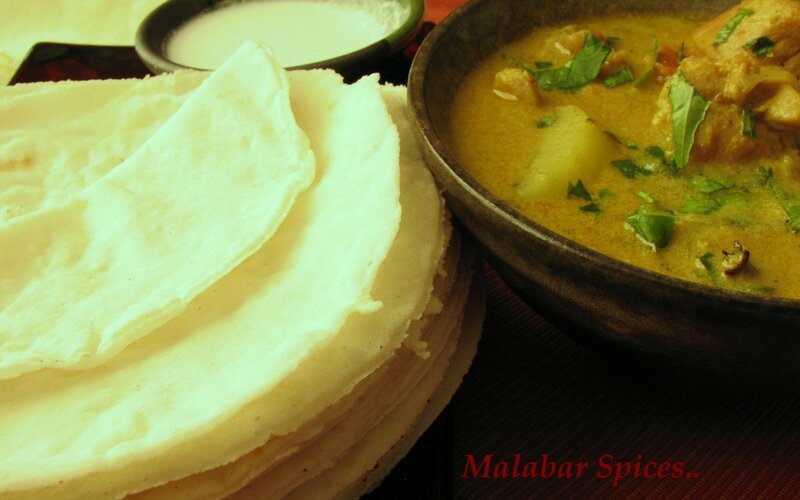 Diff: Glad to see a comment from you.Do try it and use some nadan brand of rice flour. Tina:U are welcome..Nice to see a new face. Annita: U already know how to make the thicker version, so u wont have any problems. These are looking so delicate and yummy...I may finally have to give them a try! I have never had these ever. Like Krithika, I am amazed that a rice roti can puff up like the usual gluten-rich flour roties. I had never tasted Pathiri before, but when I saw your post, I wanted to try it immediately. I didn't have any Kerala brand rice flour, so I tried with the normal rice flour. I followed your recipe to a T and it came out very well. Thanks Shaheen. Shaheen they look absolutely beautiful,the picture Wow!Will make it soon and have it with some kozhi curry;)Thank You for sharing this recipe on the ocassion of Thanksgiving! looks really good, i do want to try this out. do you use store bought coconut milk? i don't cook chicken much, it might seem like a stupid question. is there a specific kind of chicken that I have to look for to cook roast chicken? Anita, Rice pathiris are mush softer and easier to digest. Chandrika, SO happy to hear u tried it. Glad u liked it. Sumitha, U know the kozhi curry so all u have to do is make the pathiri. Smith, Glad u found it simple. I was still fretting if it was understandable enough. Annu, any kind of chicken should be fine, but try to use the smaller ones.As for coconut milk, store bought is fine. Thank you for the recipie. My 3 year old son is allergic to wheat and looks on fondly when he sees his sister eat wheat rotis. I'm looking forward to making them for him. Thanks again. Can we make it in a large batch and store ? Are there any extra works done to store them? I'm blogging your pathiri as a model recipe in my One page cookbook.